BootSkin Pro was part of the Object Desktop 2009 release. It finally allows users of Windows Vista to create and change the boot screen image with a high-resolution image. Whether you either want to change your boot screen, or create your own to share with others, the process is simple. BootSkin Pro allows you to both create and change bootskins, while BootSkin allows you only to change the boot screen. To change the boot screen simply open BootSkin, and scroll through the installed skins. Once you find one you want to use, just click “Apply This BootSkin”. That’s it, pretty simple indeed. You can get more BootSkin downloads at the BootSkin gallery on WinCustomize.com. Click “Add New BootSkin”, browse to the downloaded file, and it will install. If you ever need to get back to the default skin, just apply the Windows Default BootSkin. Creating a BootSkin for your own use, or to share with others, is just as simple. Start off by selecting the “Create a BootSkin” tab at the top of the BootSkin window. When ready, type in the title of the boot skin, enter the other information such as your e-mail, and then browse for the image you want to convert for use. BootSkin Pro will upload the image, convert it into the BootSkin format, and place it into your bootskins folder. 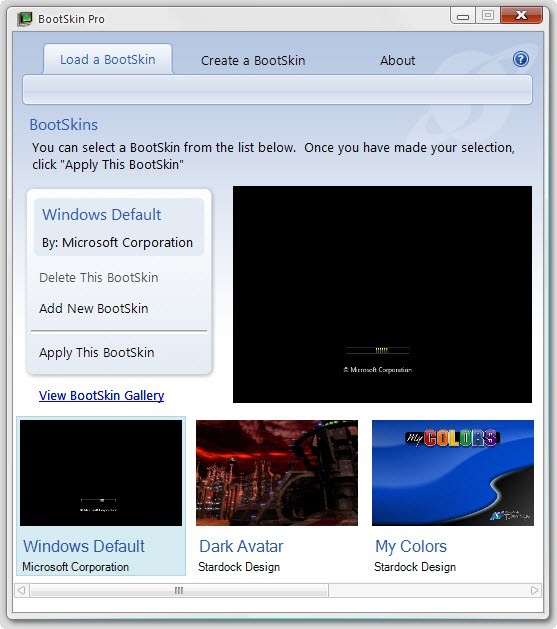 You can now apply the bootskin or upload to sites such as WinCustomize.com. Right now, BootSkin Pro is available to Object Desktop subscribers. A stand-alone download will be available soon. You can get more information at www.stardock.com/products/bootskin/. When will it be available to download for free or purchase seprately from the object desktop package? too bad that these options are not in the winxp version.. or will that ever be updated? too bad that these options are not in the winxp version..
or will that ever be updated? The WinXP version will not be updated. It has not been updated for many years and still remains unsupported at this time. I'm curious: does a large part of the code for converting the original image to bootskin format exist on the Stardock servers. It isn't mentioned in ID's discussion but I experimented with a couple of photographs and Bootskin Pro connected to Stardock and appeared to upload the image and re-download it. Also, although this topic may have been covered previously, are there certain criteria that make a "good" bootskin for Vista? The technology to create the new bootskin format is propriatary and cannot be redistributed via the software. So BSp uploads the inmage to the SD servers, converts it to the correct format and sends it back. A rather ingenious solution I think. Bootskins are art. There is no functionality that makes them good or bad. Good art cannot be defined. What you like may not work for anyone else. when will it work in the uk? Bootskin Pro v. 1.00.037 gets installed ok but doesn't work on my Vista Home Premium. When I try to apply a different skin from the default, I get an error message....? Do you think somebody could help? What goes in the serial box? My Object Desktop serial? does not work for me either. Same problems as reply number 8. Hawkeye, yes, that's what worked for me. You can cut and paste it from Impulse. Thanks for the info, Zu! Might be great if it worked. I have tried it on a Vista Home premium SP1 Machine and on Vista Ultimate Sp1 machine and error since day one....I would like to know what system "AzDude" has and how he made it work? Might be great if it worked. I have tried it on a Vista Home premium SP1 Machine and on Vista Ultimate Sp1 machine and error since day one....I would like to know what system "AzDude" has and how he made it work? I would suggest sending an e-mail to support@stardock.com, or posting a thread in the support area. Hmmm, now that sounds like a nice update to look at. You made DeskScape available for XP, a new BootSkin program would be nice. You can at least think about it. "A stand-alone download will be available soon." Oh man I can't wait for this to be released! I'm looking forward to this! It is released and available for download via Impulse to Object desktop 2009 subscribers. well skruffy, i don't think that i'm the one who needs a wake up call.. i kinda think that you may want to consider a little, but simple fact... i never said that i was upset or anything of that nature. i simply asked if the options in the new vista version of bootscreen pro would ever be made available in a new and updated version for windows xp. but since those options will never be made available in the xp version, i just simply feel that's pretty unfortunate. mainly because it would be a nice thing since the xp version getting to be pretty old and is also not supported and will never be updated. but, that is my own opinion and it also appears that it is also the opinion of a few others as well. now if i had a lack of gratitude for the products that stardock has given us, i would not be using them as i have been for the past 7 years. and i also have a great deal of gratitude and respect for those individuals who have created these products as well. so therefore, you may want to consider showning a little respct for others opinions instead of putting words in the mouths of others and implying things that were never said. I'd like to see this on XP as well. I've never been able to get Bootskin for XP to work. I load it, apply it and my system crashes. I have to go to Safe mode, select the XP boot screen (turn Bootskin off) and reboot and I'm fine. I quit using it a couple years ago because it wouldn't work. I have Vista however, a lot of my older games do not seem to work in Vista and that's a shame, I have some great games and am dissapointed in this turn of events with Vista. Anyway, I'm off topic. Bootskin Pro for XP, that would be a nice upgrade and thanks for the Deskscape upgrade, pretty cool. The only thing I'd change is allowing dual monitors to work with it. Vista Home Premium SP1 and works fine, I think I get a picture and that's it. Is there supposed to be a progress bar or anything else besides the picture? I get a picture and that's it. Is there supposed to be a progress bar or anything else besides the picture?